SPOIKS is a quick, no-twitch, go-as-far-as-you-can-before-dying sort of game. It's about figuring things out, risk assesment and daring moves. It draws inspiration from Desktop Dungeons, Spelunky, and roguelikes. Woo!. The game board is comprised of four quadrants, each containing four tiles. When you leave a quadrant, it's replaced by a new random one. The difficulty of the game ramps up according to how many quadrants you've visited. The rest is yours to figure out! PLAY THE LATEST BUILD: COWABUNGA. Please give it a spin and let me know how you fare. I'll need all the input I can get to tweak this thing correctly. EDIT: This post has been edited to include information from the initial post. It's a double post. Leveling up increases your max HP, increases your DEF and restores your HP to its max. CRIT is how likely that you'll do a critical kill, in %. A critical kill means that you kill an enemy without taking any damage. Also, camera shakes. If you land on a monster, you'll lose a number of HP equal to the yellow (bottom) number. 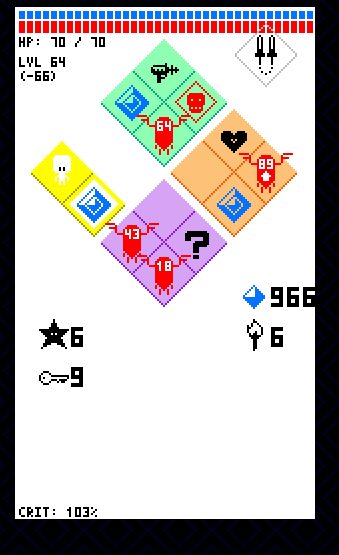 If you survive, you'll gain a number of experience points (XP) equal to the white (top) number. Those are the unit of measurement of your success. You may also spend them at shops. Small ones give +1 HP, Big ones give +5 HP. Increase your chances to do a critical kill by 2% and 5% respectively. Raise your DEF by 1 and 2 respectively. Might be overpriced right now. Aaaand there's a lot more to come! Introducing the torch, ray gun and spawner! Torch lets you know where you're going next in the current quadrant, for a limited number of moves. Ray gun automatically crits the next enemy you'll encounter. Spawner spawns monsters in the place of every heart AND spoing on the board. I've also tweaked the numbers and difficulty. In the previous build, you could eventually make it to the point where you had enough HP that you could kill a single monster and level up, which made it somewhat easier past that point. I didn't want that to happen, so I made it so that the damage caused by enemies increases (as they level up) at the same rate as your HP (as you level up) - and you don't get an extra DEF point anymore with each level. I also don't want the damage numbers of enemies (yellow number on them) to ever get higher than 99. That's not necessarily a problem right now, but I'm thinking of maybe dropping the whole 'HP increases / Enemy damage increases' scheme and rather keep the Max HP constant and damage numbers relatively low. Make actual bars for the HP/XP to make it more visual. An item that lets you barely survive the next death. A 'plasma shield', basically an extra HP bar that recharges as you move. I don't like the current 'shield' items that much, maybe it could replace that. As usual, the new version is here. After a few playthroughs there are still a few things which confuse me. 1.) I'm probably missing something, but sometimes when I have torches and it should tell me where I will go within my own quadrant it often gives me information on other quadrants aswell, and it isn't consistent, sometimes it'll just be one other quadrant, sometimes two etc. And I don't think they're insight tiles either as it occurred when I landed on things like hearts aswell. This was one of the few aspects of the game I actually found confusing and that I couldn't figure out just by playing. I assume I'm missing something about the tile colours. 3.) Perhaps a little animation/colour change on the text of stats to draw attention to the fact when they're changing. Really nice little game, gameplay and the general aesthetic fit very nicely. The idea so far seems very nice and the approach on scaling a huge role playing game to a small Monopoly version gives me a good feeling about it. On the bad side you loose points on the graphics here... it's a little to little if you know what I mean. Keep the pixel style but get in deep with some details and animations. As for the game play, kind of hard to keep up with what's going on, until I read all about it in this post. Constructive criticism, I hope! This is a very cool idea, and I really have to compliment your originality. Unfortunately, the game suffers from convolution at the moment, as it's hard to tell what's actually happening at times. Once you fix this, I think you'll have an all around pretty great game! Hey, thanks for the feedback everyone! Yes, yes and yes. I think the source of your confusion was probably insight or mirror tiles, indeed. They work both ways, which means if you're going to land on an insight or mirror next move, that tile lights up also. And they work in combination with whatever item is on them. But yeah, I myself often did think that it created kind of a 'mess' of white tiles which, although practical, is hard to decipher at a quick glance. I'll try to address that. For now, I disabled the insight tiles altogether and made the mirror's only come in 4-packs. I've whipped out a few quick sfxs with bfrx - thanks for that. As for stats, I've reworked the UI and I think it's already much clearer. Haha yeah, I will polish the graphics. I'm trying no to spend too much time on graphics right away though - it's a trap I often find myself falling for. That said, there's an enemy explosion animation to enjoy already. Working on it. I think there's already some improvement in that regard. Added an explosion when you kill enemies. Combined the two numbers on monsters into a single one, which plays both the role of damage an xp. Added a few quick sfx. I actually really like the graphics! Can I re-post that image on a tumblr I have? Tonight I learned how to make animated gifs from a canvas game. Turns out it's pretty simple thanks to this. However, not losing frames is a bit tricky since Phaser skips frames to keep up - due to recording-induced lag and my super non-impressive hardware. What worked best so far is recording the game at 1:1 scale (without the 2x zoom, that is), then optimizing, speeding up and scaling up the resulting gif at ezgif. If you know a better workflow, I'm all ears. http://gametinder.com/ is the tumblr. I'm just collecting and sharing images that make me think of game ideas, with the occasional text post thrown in. Only started it last week. Not exactly what I'm doing, but I'm getting the hang of it and I really like the aesthetic and tactical nature of the game. Do you have any plans for a mobile version? A game like this would probably work well on touch: quick playthroughs, simple controls, etc. Great job, everything is alot clearer. Very interested to see where your going to take this from here. Today I got distracted from my pretty loose todo-list and made an invincibility powerup. It makes you invincible for the next 4 moves. It looks and feels much better in the game. I really want to add in the keys and treasure chests next (you need one to open the other), but after that I think I'll take a little break with the content to make a preloader and some sort of tutorial/in-game help. I've been away for the whole last week and in fact, I'm going back there tomorrow. My progress has thus slowed down, but is far from having stopped. I did a couple of things. I've been sorta distracted of my objective which was to have some in-game help and a preloader done, in favor of fancy(er) visual effects. Oh well haha. Implemented the keys and chests locked tiles. The tiles now fall and fade out instead of simply disappearing. And replacement tiles fall from the top of the screen. Added a trail behind the character when he moves to a tile. Up next: the aforementionned stuff and code cleaning. Oops, there was a weird bug with the shop. Long story short, the shop sprite didn't reset correctly when a '?' was grabbed. I took this opportunity to make the movement trail more subtle. And also, by pressing the Space bar, you can now toggle whether new quadrants arrive from above or are simply static - as they were before. I'd appreciate your input on this... I think it's nice visually, but it's kinda distractive? Added an arrow icon on monsters when that will allow you to reach next level. Added a skull icon on monsters that will kill you. Removed the small hearts powerups, only the bigger ones are left. - Give as much feedback as possible to the player as to what is happening. - Make a tutorial. AND Have a way for the player to get info at any time about the elements on the board and UI. The game is back here! I progressively forgot to update this devlog as I got too absorbed into making the game itself and other lifestuff. I've also been spending quite a lot of time planning an awesomely complex feature, before dropping it in favor of a way simpler solution. I guess since I had nothing new that was playable and balanced to show, I didn't post anything about whatever I was up to. In retrospect, that was kinda silly. Documenting mistakes is fun. But hey, I can still make up for it. So behold, the tale of the lost inventory! It all started when I realized that before making a tutorial and in-game help, which I planned to do next, It'd be best to have the gameplay and layout completely figured out. My main concern was that I wanted to implement items that the player could use whenever they'd like rather than instanteneously. That raised a few questions. Would it be magic? items? magic items? Would using them cost spoings? HP? Mana? Or would they be one-time only? Oooh and there had to be items with passive effects also! In any case, there was a nice vacant space in the UI, lower-right. Perfect for one big button or a few smaller ones. So I first made a mockup of a layout with that one big button, which made sense. I didn't think only one item/spell at the time would be enough though, and it bothered me. I think that's where things got out of hand. My next move should have been to go ahead and try implementing the simplest possible solution - one usable item at the time, one-use only, a la Mariokart. Instead, I thought of a neat 4-tiles inventory/equipment hybrid system which would rely on 4 smaller buttons. Some items would be useable, some passive. You'd need to drag the passive items to the proper slot, but useable ones could be used from any slot just by clicking them. I started implementing that solution, but I was worried that these buttons would be too small for eventually-targeted mobile platforms. So I fused them back into one big button, which opened a similarily-shaped inventory/equipment menu in the place of the usual game board. That menu was quite pretty. I figured out how it would work to use and drop items - by dragging them at the appropriate place rather than just clicking them. All in all it seemed pretty ergonomic and elegant. I was pleased. Then I needed actual items to go in that inventory. Here also, my solution was overkill. I decided on a few basic categories: hats(head), socks(feet), mugs(hand), scrolls(use once), boxes(use a couple times) and chips(passive effect in any slot). Hats, socks and mugs would sometimes have an useable effect as well as a passive effect, and it would cost yet-to-be-implemented mana to use them. I made a list of useable effects and a list of passive effects. Items would be generated by selecting one of the basic types and attaching random effects to it. A points system would ensure that a given item would have the desired value, and the intensity of some effects could be adjusted to that end. The name of the item would reflect its type, effects, and effects parameters. That would lead to amazing names such as "BARELY SHARP MUG OF AWESOME RANDOM GLOBAL EXPLODE". Yes. At that point, an awesome friend told me I was overcomplicating things. She was right, but I thought it was worth it anyway. I implemented that system up to the point where I had a few items working. One downside was that the player could not rely solely on stuff's graphic representation to know what it does. It also meant more clicks / drags were required to use an item. It didn't really help in making the game look simple. But I liked how it was shaping up. And then boom, last week, I changed my mind. I went for the Mariokart approach instead, and it feels great! I can't recall for sure why I took that decision, but I'm glad I did. Balancing all these items and effects would have taken a lot of time, as opposed to the handful of "magics" that are now implemented. I also feel like it suits the minimal/short scope of the game more nicely. I still keep following the same patterns and making the same kind of mistakes. Feature creep is one of these patterns. Hopefully, writing about it will help with that. But hey, despite the fact that I've been running in circles, I'm really close to having a build with what I'd dare call final gameplay in it. Ooouuuh, so exciting. I'm excited. No playable update yet, but i'll be back soon! Very interesting concept! I really like the way you use randomness: it's not hidden somewhere, to the contrary, it's at the core of the game experience. I would say that, probably, this is one of the best minimanist game mechanics I've ever played! Leveling is bad. Do not kill if you can help it. Enemies get stronger much faster than you and by 30s? you'll face enemies that can 1hko you. Tactic is to keep spoinging as much as you can until you see: gun, sword/swordchucks, key and collect them if possible. Use ? if you don't see any of the above BUT don't forget to go to the shop. If you have torch and see you can hop to an empty/safe square that is otherwise filled with monsters- take it and then get out of there. Same if you are invincible with the star. Refresh those squares until they give you something you want. Don't worry about gems. You get way too many of them (I stopped trying to collect them midway on the screenshot). This game is very neat and addicting! I made a profile just to comment on it! Now make an android version please.